I can’t help feeling that this is repulsive, the desire to be cyborgs is hardly a bright future. Cyber tech might help my arm oneday. I hope it does, assistive technology has great merit and purpose, but this is not that. It looks like something Michael Jackson would’ve worn. What do you think the lasers are for? Inviting strangers to touch me, no thanks! I’d end up being the one walking around with “Friends 0” lit up on my chest! “Follows” in the real world are often accompanied by law enforcement involvement and/or restraining orders. Show me on the bunny where he touched you.. While this looks okay in the PR photo above, the truth of the matter is that I’m going to be a 300+ man in his 40’s walking around asking people to touch me. People have gone to jail for less! I was thinking the exact same thing when I read the title of this article. Really scary how people do not understand how this can be so easily abused. Some people say I wear my mind on my sleeve. 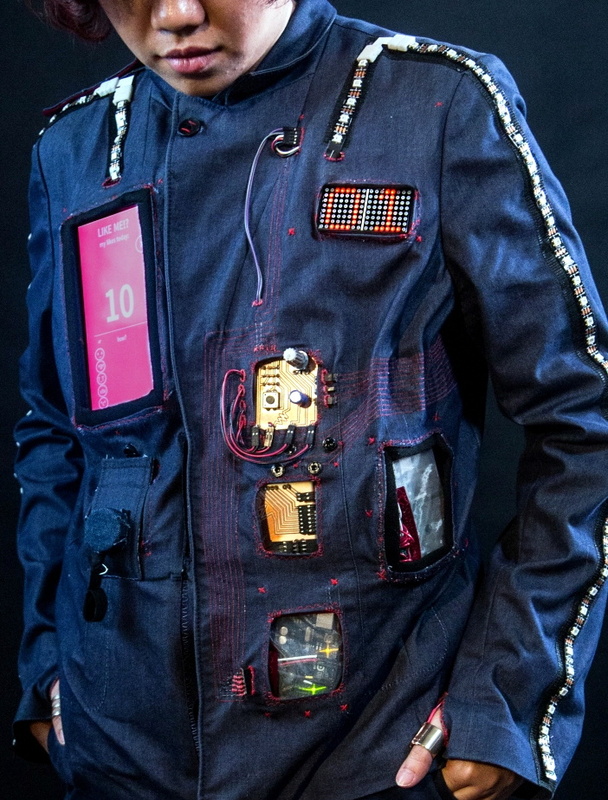 I don’t want to wear that much electronics unless I’ve got full hepatic feedback VR technology, power-armor, hearing enhancement, and total omnidirectional video recall. Then I’d be happy wearing that much tech. ooo…ooo…inernal suit temperature regulation too.